KNOXVILLE, Tenn. — No. 10/10 Tennessee (11-1) heads out on the road to open SEC play on Thursday night, paying a visit to an Auburn team that is 12-1 and undefeated in six home games this season. Tip-off is slated for 6:02 p.m. CT (7:02 ET) at Auburn Arena, with the game available on SECN+ and the Lady Vol Radio Network. UT enters on a three-game winning streak after losing its only game on Dec. 18, a 95-85 setback to No. 8/9 Stanford in Knoxville. Auburn, meanwhile, rides a nine-game winning streak into Thursday night’s match-up. The Tigers are coming off an 83-50 home victory over Alabama State on Saturday. Brad Law (play-by-play) and Joe Ciampi (analyst) will describe the action for SECN+. Tennessee holds a 43-11 all-time record vs. Auburn, dating back to Feb. 9, 1980, and has won 27 of the past 30 games in the series. The Lady Vols are 21-2 vs. the Tigers in games held in Knoxville, 13-5 in games played at Auburn and 9-4 at neutral sites. UT has won in 13 of its last 15 trips to The Plains but lost the last time in Auburn. UT is 2-0 vs. AU in overtime games, winning extra-frame contests in Knoxville vs. the Tigers in 1996 and 2004. Tennessee has limited Auburn to 66 points or fewer 11 of the last 12 times they’ve met and to 61 or less on nine of those occasions. Tennessee and Auburn played for the 1989 NCAA Championship in Tacoma, Wash., with the Lady Vols prevailing, 76-60. Tennessee also beat the Tigers in regional finals in 1987 and 1991 en route to NCAA Final Fours they would end up winning. UT and AU four times played for SEC Tournament titles from 1985 to 1990, with the Lady Vols winning three of those (1985, 1988, 1989). Chamique Holdsclaw scored a career-high 39 points vs. the Tigers on Feb. 14, 1998, marking the sixth-highest point total in Lady Vol history. Auburn has managed to claim only two victories in Knoxville, with those coming on Jan. 9, 1988 (#2/3 AU def. #4/4 UT, 71-68) and Feb. 8, 1986 (#11/13 AU def. #10/12 UT, 66-60). These teams will meet again at 7 p.m. on Valentine’s Day (Feb. 14) in Knoxville. AU coach Terri Williams-Flournoy beat UT and Pat Summitt while coaching Georgetown on Nov. 27, 2010, 69-58, at the Paradise Jam tourney in the U.S. Virgin Islands. THREE WHO’LL GET YOU 20: UT has three players who have shown the ability to score 20+ points on any given night. Evina Westbrook (6), Rennia Davis (2) and Meme Jackson (2) have combined to produce 10 20-point games this year. DAVIS RISING: After being limited to seven points at Texas, sophomore Rennia Davis has bounced back by averaging 16.0 points and 9.0 rebounds in five games since. She is coming off a 20-point, 13-rebound double-double vs. Murray State last Friday and a 19-point, six-rebound effort vs. Belmont last Sunday. FRESHMEN PRODUCING: UT’s four rookies are averaging a combined 31.5 ppg., 17.0 rpg. and 10.5 spg. and shooting 49% on FGs and 44% on 3FGs the past two games since returning from winter break. SMOOTH JAZ: Rookie Jazmine Massengill is averaging 8.5 ppg., 5.5 apg. and 4.5 rpg. and shooting 64% on FGs (7-11) and 75% on 3FGs (3-4)over the past two games. SHARING THE BASKETBALL: UT has averaged 20 assists the past three games, recording 20 vs. ETSU, 21 vs. Murray State and 19 vs. Belmont. THREE-BALL FREQUENCY: UT has hit seven or more three-pointers in five straight games. 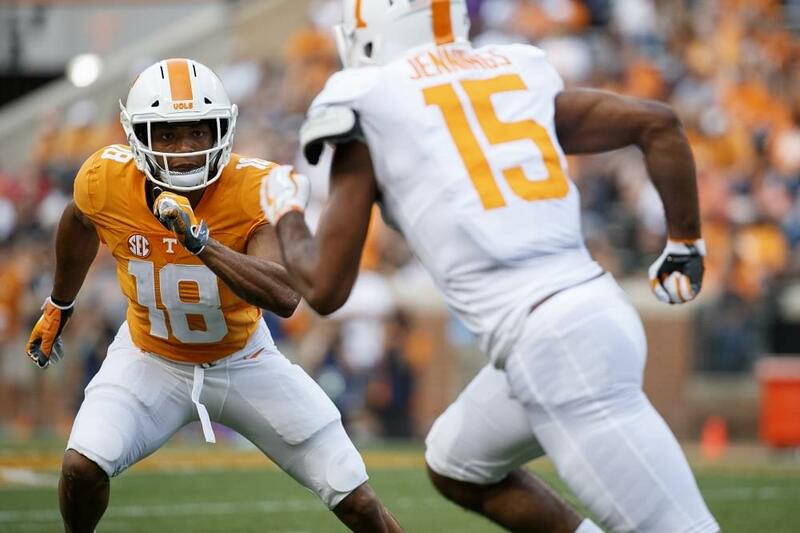 Tennessee had never done that in more than four consecutive contests. The Lady Vols have knocked down nine or more 3s in four of their past five outings. POINT PRODUCTION: After scoring 65 points vs. Stetson, the Lady Vols have averaged 87 points since then, tallying 88 vs. Texas, 85 vs. Stanford, 80 vs. ETSU, 98 vs. Murray State and 84 vs. Belmont. Three-balls have been a key to that increase. BOARDS ARE A PRIORITY: UT has been a solid rebounding team all season and the numbers bear that out. The Lady Vols have outrebounded 10 of 12 opponents and rank No. 11 in rebounds per game (45.42), No. 11 in rebounding margin (11.9) and No. 15 in offensive rebounds per game (17.0). No. 10/10 Tennessee led by as many as 18 points before holding off a late rally to secure an 84-76 victory over Belmont in front of a season-best crowd of 8,546 on Sunday afternoon at Thompson-Boling Arena. Auburn returned six letterwinners, including four starters from 2017-18, including stars Janiah McKay, Daisa Alexander and Unique Thompson. The Tigers have started the same five in all 13 games, including seniors McKay and Emari Jones, redshirt junior Crystal Primm, junior Alexander and sophomore Thompson. Auburn is led by Terri Williams-Flournoy, who is 114-92 in her seventh season at Auburn and 257-196 in 15 years as a head coach. The Tigers like to press and average 12.7 steals and force 21.8 turnovers per contest. AU has wins over Oklahoma (95-79) and North Carolina (86-81 OT) and a loss to #25 Iowa St. (67-64). A year ago, Auburn turned in a 14-15 overall record and 5-11 mark in the SEC to finish 10th. UT ended the Tigers’ season in the SEC Tournament second round, 64-61, on an off-the-glass, three-point buzzer-beater by Rennia Davis. Daisa Thompson made the 2018 SEC All-Defensive Team, while Unique Thompson was All-Freshman. Freshman Brooke Moore scored a career-high 23 points, and Auburn pulled away early and cruised to an 83-50 victory over Alabama State to close out non-conference play Saturday at Auburn Arena. The Tigers (12-1) will enter SEC play on a nine-game winning streak, their longest since 2012-13. Despite shooting a season-low 31.4 percent from the field, the Tigers hit 10 3-pointers and found other ways to score, going 29-of-36 (80.6%) at the free-throw line. It marked the most free throws made in a game by Auburn since 2008. Rennia Davis knocked down a three-point shot with .5 seconds remaining to give No. 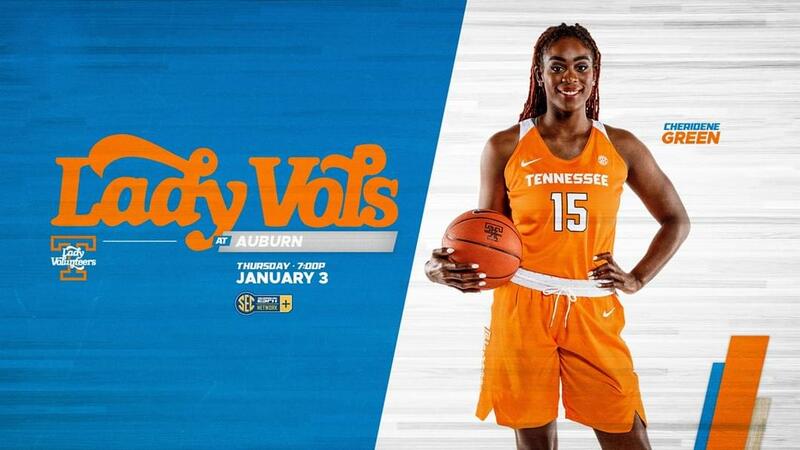 12 Tennessee a 64-61 victory over Auburn on March 1, 2018, at Bridgestone Arena and advance the Lady Vols to the quarterfinals of the SEC Tournament. Jaime Nared led UT in scoring, hitting 17 before a hard fall on a layup attempt eventually sidelined her. Mercedes Russell had 12 points and 15 rebounds to record her 45th career double-double, tying Candace Parker for the second most career double-doubles in Tennessee history behind only Chamique Holdsclaw. Davis and Meme Jackson also scored in double figures for UT (24-6) with 16 and 10, respectively. Auburn (14-15) was led in scoring by Janiah McKay with 24. Daisa Alexander added 16 for the Tigers. In two other recent games: UT also beat AU in Knoxville last year, 70-59, on Jan. 4, in UT’s first SEC home game. The last time these programs met at Auburn, the Tigers scored 33 points off 22 UT turnovers to claim a 79-61 victory. UT welcomes Missouri (2 p.m. on 1/6) and Kentucky (7 p.m. on 1/10) to Knoxville for its next two games. AU will travel to Florida (1/6) and Alabama (1/10) for its next two contests.